This was a gig I savour more in my mind 24 hours after the event than when I was actually there. I have had this feeling before: the first time I saw Brad Mehldau’s Mehliana at The Village Underground. I just didn’t get it. It was too loud, I couldn’t see. Then I saw him again at the London Jazz Festival and it clicked. This new project of John Law has the same effect. Boink! is the electronic brainchild of guitarist Rob Palmer and John Law. The press release says the idea is to explore “electronic sounds and effects over drum grooves. Spontaneous group interaction between keyboards, soprano/bass clarinet and guitar, coming out of pre-composed electronic music scores. Underpinned by propulsive drum grooves. Jazz, rock, ambient, electronic…” So we knew what we were in for. Or did we? But seeing the project live, with a screen showing videos by Patrick Dunn which became increasingly interesting, absorbing and distracting as the evening wore on, I felt I was being overloaded with sensory experiences – I just couldn’t absorb them fast enough. Now as I unpick the experience I can see that the concept is extremely good, it just needs a bit more time to bed in as a live venture. There were so many experiences crammed in – an obscure piece of Samuel Beckett, our responses to 9/11, the challenge of being a jazz musician performing to an indifferent chattering sophisticated audience, what it’s like to be a tortoise ( yes!). I wondered what it was like on the stage – the musicians couldn’t see the visuals behind them or our expressions as we listened. Maybe in future the setup could allow visuaIs to be seen by everyone so there was true interactivity? I missed the cool clarity of Jon Lloyd’s sax (he is on the album and Laurie Lowe is on drums). But I admired the delicate poise of Lloyd Haines on drums, the quick thinking of Rob Palmer who could change mood swiftly (this was 90% improvisation after all) and as always the mesmeric skills of John Law on keyboards. I hear that John’s next project is an animated version of Bach’s Goldberg Variations. Please slow down John and let us grow into Boink! The album really does grow on me, I just need to catch up. I am calling it a Festival of the Guitar: It was a masterly stroke of scheduling – Stratford Jazz features some of the most exciting guitarists on the UK scene in the next few months so here’s my preview of six gigs worth turning out for. What’s thrilling for me is that we get to hear very different styles of music, guitars, guitar playing and influences. 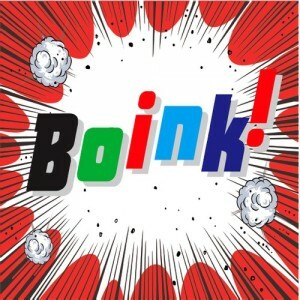 First up we host John Law’s Boink! on 12 March. The guitarist in question is Rob Palmer who I last saw at Sherborne Jazz with Jon Lloyd and John Law. Boink! is the latest project from John Law which takes him away from acoustic pianos and into the world of electronica and interactive visuals. Intrigued? In a recent interview in Jazz UK (issue 115) Rob said that the electronic backing tracks are composed leaving the musicians free to improvise 90% of the time. It will be a combination of total freedom and totally composed music, he says. 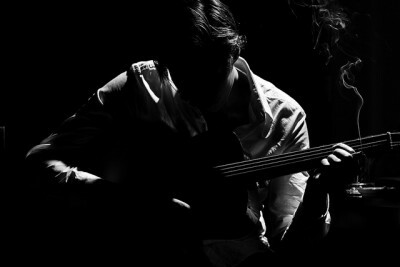 No sign of electronics with our next guitarist, the acoustic and classical guitarist Maciek Pysz who makes his debut appearance at Stratford Jazz with his stellar trio of Yuri Goloubev on double bass and Asaf Sirkis on percussion on 26 March. Maciek is on an extensive UK tour promoting his album Insight which received rave reviews across the globe last year. He appears at Stratford the day after an important gig at Pizza Express Jazz Club, Dean Street, London with a guest appearance by Tim Garland who recently signed to Edition Records. Insight was my album of 2013 so I can’t really add more other than to say that the last time I saw this trio they blew the roof off Kings Place, gathering a larger crowd in the foyer than in some of the concert halls. They filled the huge space, just as they filled the windy park at Ealing Jazz Festival last year. We can expect a more intimate, conversational evening of Maciek’s beautiful lyrical compositions, exquisite arco bowing from Yuri and sensitive percussion from Asaf. As Maciek said in an interview in 2011, ‘I do not want to be perceived only as a jazz guitarist, I’m an acoustic guitarist who mixes genres’ and therein lies his attraction. His influences are John McLaughlin, Ralph Towner and Al Di Meola yet he sounds like none of these, he has his own voice. On 9 April we host Phil Robson with his new organ trio featuring Gene Calderazzo on drums and Ross Stanley on Hammond organ. Phil Robson’s discography contains a jazz who’s who of musicians from both sides of the Atlantic – Mark Turner, Michael Janisch, Christine Tobin (the celebrated Sailing to Byzantium), John Taylor, Liam Noble – and he brings a breath of New York to Stratford with his drummer, whose drumming John Fordham described as scalding! Listening to their demo clip on Soundcloud I was minded of Steely Dan – that was just the organ I imagine, but we can expect what Roy Stevens is already predicting will be the gig of the year at Stratford! On 14 May we are joined by a newly formed band called The Orient Quartet. This features Dan Messore on guitar. Dan’s own quartet called Indigo Kid features none other than Iain Ballamy. Kevin le Gendre said of Dan ‘It’s fair to quote names like Pat Metheny and Frissell as references but the seam of jazz Messore is mining goes back further to such as Charlie Byrd and Jim Hall’. Combine this with Steve Waterman‘s trumpet (as heard on Carla Bley’s albums on ECM) and you can see we have a very heavyweight new band. On 11 June we feature Nic Meier who brings his glissentar with its eleven fretless strings which provides more than a touch of the orient to the sound, a heady mix of Turkey, central Europe, Iberia and the Americas. His quartet features the artists who appear on his recent album Kismet. Look out for his flamenco treatment of Coltrane’s Giant Steps! Our final guitarist is Jon Dalton on 25 June. Jon has been playing guitar since he was seven and cites Wes Montgomery as an influence. He brings a trio with a Hammond organ virtuoso so we can expect a vibrant set. If you like Gibson guitars then come along! So join us for these wonderful gigs, and keep jazz alive outside London. All gigs start at 8pm and tickets on the door are £10/£12 for Phil Robson, half price for students. We look forward to welcoming you to our jazz club and our Festival of the Guitar. This is an extremely elegant album. I don’t know why I am surprised at saying this. 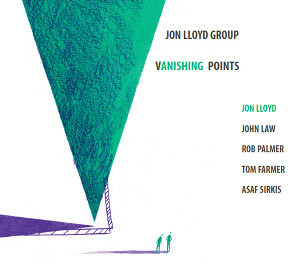 I suppose I thought that saxophonist Jon Lloyd, a musician who has spent his life exploring the boundaries of structure and freedom, would be challenging, in a negative sense. I was wrong. At Sherborne Jazz Club on 7 December, tempted out by the name ‘John Law’ I once more saw piano and fender rhodes in mutual support (the earlier occasion was Brad Mehldau at the Barbican). If I had been distracted by the pianist, then it took only a few minutes to realise that this is a very special group led by a very expressive, communicative and generous leader. The lineup on paper was breathtaking – Asaf Sirkis, Tom Farmer and Rob Palmer. Last minute changes of personnel saw Mark Whitlam and Joe Limburn replace the drummer and bass player respectively. They both had the gig of their lives, showing no signs of being replacements. They were sensitively supported and encouraged by Jon and John, allowed solos and the freedom of their illustrious forebears on the album. It was a memorable evening, serving as a reminder, if one were needed, that excellent, accessible and enjoyable jazz can be heard outside London, you just have to make an effort to get there. The experience of the evening was an accurate flavour of the album. All nine compositions are gems. The exquisite X and Y opens the album with buoyant bubbling soprano sax. Even at its most penetrating, it has a warm, serene, caramel sound. The melody is pastoral, gentle, songlike. The lyricism of John Law is always heart stopping, such delicate shading, especially in Yaga where the piano could be a sitar. In 5678 I felt we were in square dance territory, where quick footwork was needed as the time signatures crossed, got jumbled and tripped each other up. It was fun! I thought ‘This isn’t free jazz, I can hum this (phew! )’ and I relaxed, and so became more receptive to the delicacies on offer: the symphonic, almost-classical opening to V Points where the piano solo, with gentle snowflake motif (a signature John Law effect), creates a mood of uneasiness echoed by the slowly burning guitar, the wary walk of the sax towards a guitar that howls, a sense of chaos and pain which gently fades. The thrum of fingers on piano wires. There are many strands in this music, you uncover them with repeated listening. It is harmonious and democratic, there is no need for extended solos, yet take any instrument away and you would miss it. The video below, from June 2010 (and not on the album), is a wonderful taster of this very classy quintet, with slight changes of personnel. They deserve greater recognition for the beauty of the harmonies and melodies, the purity and serenity of the saxophone, the electronic subtleties, its modesty despite a starry lineup. The group tours in 2014, please go and see them! This group must not vanish.